Although Valentine's Day is just 2 days away, it isn't very hard to do something a little special to mark the day and to give your loved ones a special treat. I thought I would share two things that I going to do to make Valentine's Day a little bit special for my husband and I. My husband doesn't get home from work until around 7:00 PM. We usually have a light supper together when he gets home to our empty nest. I think a couple of sweet treats for dessert will be a nice way to mark the occasion and add some sweet romance. Surprisingly, the weather has been a little chilly this year in Phoenix and I know it has been a LOT chilly for many of you across the country! 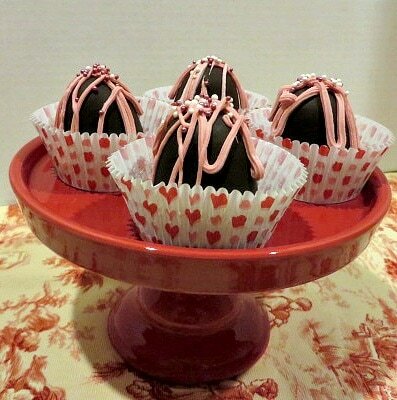 Some Chocolate Covered Strawberry Hot Cocoa Bombs will be just the ticket to warm us up. We even made a video to show you how to do it! Just click the link or the picture. Be sure to use yourcutest mugs! For dessert, a piece of candy (or 2) like these Butterscotch Not So Squares that are a copy cat of See's delicious Butterscotch Squares that I love. The recipe is simple. I posted it on this post. Favorite Non-Chocolate Candies with Free Valentine Printables! Whatever you decide to do, have a sweet day! Better than a candle! A heart shaped sparkler! Get them from Beau-coup! So. It's the weekend before Valentine's Day and you still haven't gotten a gift for that special someone like you've been meaning to, eh? Luckily, I have put together a list of three super easy DIY gifts that will not only make awesome presents, but not look like you threw them together last minute. And the great news is that each of these gifts can be easily tailored to fit whomever you are gifting them to, be it a boyfriend, parent, or a friend. The first gift we have is diy bubble bath. Now, there are plenty of great from-scratch recipes out there. I honestly was too lazy to do that. The easiest thing to do is to buy a body wash that you like (pay attention to the color and scent) and add castile soap to it. I use Dr Bronner's. The ratio I used was about 2:1 body wash to soap. I also added in a bit of warm water. Mix it all together and then funnel it into a jar. I used this cute jar and painted the lid with pink glitter. This is the perfect gift for a gal pal or sister. This one is super cute for someone who might be a bit nerdy. It's also really simple. All you need is a rubik's cube, six photos of you and the recipient (or if you don't have six together you can be like me and just do one of your face), and some mod podge or Elmer's glue. Make sure the photos are square (Instagram photos work well for this) and cut each one into nine smaller squares. Then glue the photos into place on each side of the cube. This gift is versatile as it is both sentimental and can be used for entertainment purposes! I call this last one Boyfriend in a Box, but obviously you can call it whatever you desire. The concept of this one is just fitting small, random gifts that remind you of a person into a box for them. It's sort of like a care package. I just used a box I got from Influenster (if you want to see what I've gotten, you can check out my personal Instagram where I will be posting about the products) and filled it with tissue paper and confetti strips. In it I placed some fun socks, lotion, a Rubik's Cube with photos of us, pens, an Amazon gift card, and Reese's Cups (his favorites) with a few De La Rosa Mazapan (my favorites). I'm also including a little love letter. There really is no "theme" to this box, it's just little things that made me think of him. So as you can see, the possibilities are endless. I hope you found this list of last minute Valentine's gifts helpful and I hope you give some of them a try! Good luck out there!